ABS has been and is one of the most popular plastics in 3D printing, but with the arrival of new materials that are easier to print or even more resistant, its flaws are becoming more evident: it is difficult to print, it emits an unpleasant smell… Are there any uses for ABS in 3D printing? We give you all the keys to ABS and the projects for which you should decide for it. Why is ABS such a popular 3D printing plastic? The reasons why ABS is so popular are mostly historical: it is a thermoplastic that was already being used in the traditional manufacturing industry when additive manufacturing development began. Thats how it ended up being one of the first 3D printing polymers. Due to its availability and applications, ABS was one of the thermoplastics best positioned for using as a material at the dawn of 3D printing. It is the primary material for Stratasys printers, the pioneer of 3D FFF printing. When the RepRap movement began publishing the printers from which most of today’s desktop models are derived, ABS was the most popular and readily available 3D printing material. It also printed better than PLA on those first hotends of early DIY printers. Today ABS is still widely used, but new materials have appeared that are replacing it: PLA is the most popular material because it is easier to print and does not emit odors, and new filaments are being introduced that outperform its mechanical properties. However, there are still some specific uses for which ABS is still the best material, and that is what we will talk about in this article. But first, a few recommendations on ABS. What are the drawbacks of ABS? Odor and emissions. ABS emits a strong odor when printed, the odor commonly known as burnt plastic. Not only does this smell makes it very uncomfortable to stay in the same room as the printer when it is working, but there are also studies that prove that the fumes are toxic. Warping. ABS shrinks significantly as it cools, which is the source of all its printing problems. When the first layer of a printout cools, even with a warm bed, it shrinks and begins to peel off and rise from the corners. This printing defect is known as warping and is difficult to avoid on medium to large ABS parts. Cracking and delamination. Cracking and delamination are two terms that refer to the same phenomenon: the layers of an ABS 3D print tend to separate (delamination) or even crack due to internal tension created during the part’s cooling. Like warping, as they are defects caused by the contraction of the material during cooling, their effect is greater the larger the part is. With the problems we have discussed, in most cases it is not convenient to use ABS for 3D printing as there are other alternatives that are more effective and easier to print. General purpose parts. The best general purpose plastic is PLA, without a doubt. PLA is the easiest material to print, with the best finish, doesn’t smell bad and is easier to find at any supplier in any color or variety. For these reasons it is the default material for particular printers and printing services such as Bitfab. For the vast majority of 3D printing parts, especially if they are not going to withstand high stresses or temperatures, PLA is the best choice. Stress-resistant parts. This is one of the sections where ABS is completely unjustified. For resistant parts it is better to use PETG, which is a plastic with greater resistance to traction and impact than ABS, in addition to not suffering delamination, resulting in parts much more resistant than those made with ABS. You can find out more about PETG in the superpost we made about this material. Another consideration regarding resistance: sometimes it is easier to simply add more perimeters and infill material to the part than to resort to more complicated materials such as ABS. Heat resistant parts. ABS does have better temperature resistance (softening from 105°C) than PETG (80°C) and PLA (70°C). But if you really can’t withstand the resistance of PETG, it may be a good option to try Nylon, which is not as easy to print as the above but can withstand between 100 and 200ºC, depending on exposure time and formula, and also has excellent mechanical properties. Large parts. Printing large parts on ABS is a nightmare because of the thermal contraction it undergoes. If you are going to print large parts it is much better to use PLA or PETG and avoid the headaches. To print ABS, except for very small parts, you need closed printers that maintain a warm environment around the part. The hot bed is essential and without a closed chamber, problems of warping and cracking are intensified. The gases emitted by the printer smell bad, can cause headaches and can be toxic, so it is best not to be in the same room as the machine while it is working. Finally, there is a specific case in which we believe that printing with ABS is the best option: when you are going to use acetone afterwards to polish or glue the part. Smoothing ABS with acetone. To smooth the surface of the printed parts there are two methods: acetone application, or the introduction of the part in a chamber saturated with acetone vapour so that it is deposited on the surface and the printing lines are dissolved. The finishing from this technique, if done correctly, can be completely smooth and glossy. Gluing ABS with acetone. Acetone also allows you to glue pieces of ABS by applying it to the surfaces you are going to attach and joining them together when the plastic is dissolving. If you don’t know what we mean by acetone smoothing, you can watch this video of BCN3D – the Spanish manufacturer of the Sigma printer– in which you can see both the process to follow and the final finish of the piece. Small parts. If you are going to print small parts and you have a printer ready (warm bed and preferably closed chamber) you can try ABS. Small parts won’t be a big problem although it will always be a harder material to master than PLA. Sanding. It is true that ABS is sanded a little better than PLA; if you have to sand the part, you may prefer to make it with ABS. But remember: for large parts, where you will have to sand a lot, it will also be much harder to avoid defects with ABS in 3D printing, so think carefully before you start. Temperature resistance. It’s also true that ABS has considerably better temperature resistance than PLA and even PETG. So, if you don’t want to venture out with Nylon, you can still use ABS for these parts. At Bitfab we have been printing for several years and almost never used ABS. It is so difficult to print for large parts that we would have to charge very expensively in order to do the tests and repetitions needed to get a perfect part. With the new closed printers we are designing and building we will be able to offer ABS at affordable prices. In depth post on PETG, everything there is to know about PETG for 3D printing. ABS is a very popular material in 3D printing because it has been used since the beginning of this technology, but today there are other alternatives easier to print or with better properties for the vast majority of cases of use. We recommend using ABS in 3D printing when you are going to smooth or glue the parts with acetone. 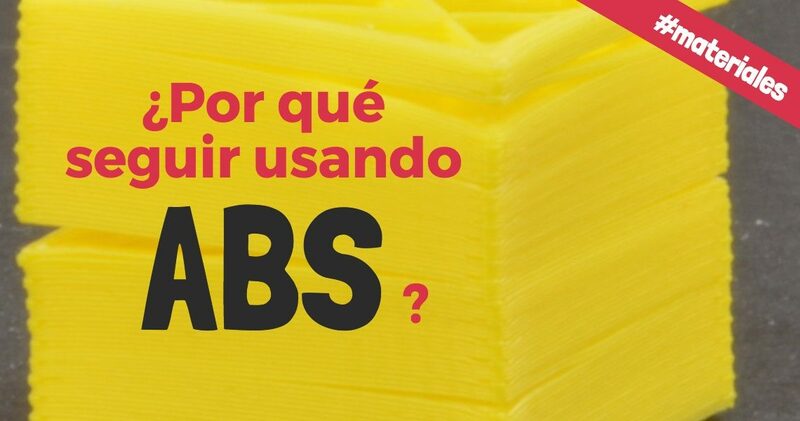 For general purpose parts use PLA and for heavy duty parts use PETG or ASA.El ABS es un material muy popular en impresión 3D porque se viene usando desde los inicios de la tecnología, pero hoy en día existen otras alternativas más fáciles de imprimir o con mejores propiedades para la gran mayoría de los casos de uso. Did you enjoyed this article? Here at Bitfab we love to share what we learn every day printing parts for our customers. If you liked our job, help us reach more people by sharing this post in social media.